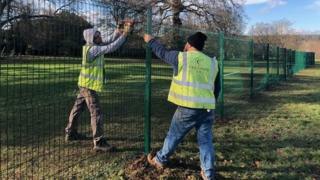 A fence around a green space at the centre of an eight-year battle costing hundreds of thousands of pounds is set to be completed this week. The land, in Bristol, was used as a playing field until a school three miles away leased it for sport lessons. Locals have objected to a mile-long (1.6km), 6ft (2m) high perimeter fence being put up, due to safety concerns. We Love Stoke Lodge said the £65,000 "Berlin wall" fence robs them of the "last bit of open green space" locally. The field was sold to the council in 1947 for educational use and until eight years ago, Cotham School shared the fields with the community without issue. It needs the space for sports lessons and matches because the school does not have enough land at its inner city site. But the decision to install a fence has received intense opposition over many years. A petition claiming the the fence needs planning permission has received more than 4,000 signatures. The campaign group said the council was "bending the law" by allowing the fence to be built under permitted development rights - rather than having to go through the full process of gaining planning permission. Campaigner Helen Powell said: "If there had been a proper application process and if councillors had heard all the arguments and had decided that a fence could go up, well, that's the democratic process for you." Local residents are also concerned over the treatment of trees on the site, many of which have orders to protect them. Cotham School took out a 125-year lease for the site with Bristol City Council in 2011 and used it for the first few years - but moved to a nearby sports centre because of concerns over the site being accessible to the public and dogs. The ensuing battle over whether the land was protected from development under Town and Village Green legislation ended in the High Court with judges siding with the school. Last May, the school said it would return to the land in a plan that would save it £26,000 per year, and started building the fence. Allison Crossland, from Cotham School, said it had a right to use the fields. "We maintain them. It's not paid for through council tax, it comes from our school budget and we have the right to use those for the purpose they were leased to us for," she said. She said teachers locking and unlocking the gates would mean no dogs on the land or "dog excrement". The school has promised that, when children are not using the space, it would be left open to the public - but not to dogs. It said the field was an "outside classroom" and clearing people away "would be like having to clear dog walkers out of your English class". Locals said the move had sparked "a lot of concern and stress", that the fence would "change the character of the land forever" and significantly restrict their use of the field. Politicians in the city are divided over the row, with North Bristol MP Thangam Debbonaire saying "objections to the fence are excessive and unreasonable... students need playing fields which are safe and seen to be safe". However, Bristol North West MP Darren Jones said "a fence at all costs" approach was an "overreaction to the original risk assessment taken by Cotham School". The council said it was unable to comment for legal reasons.